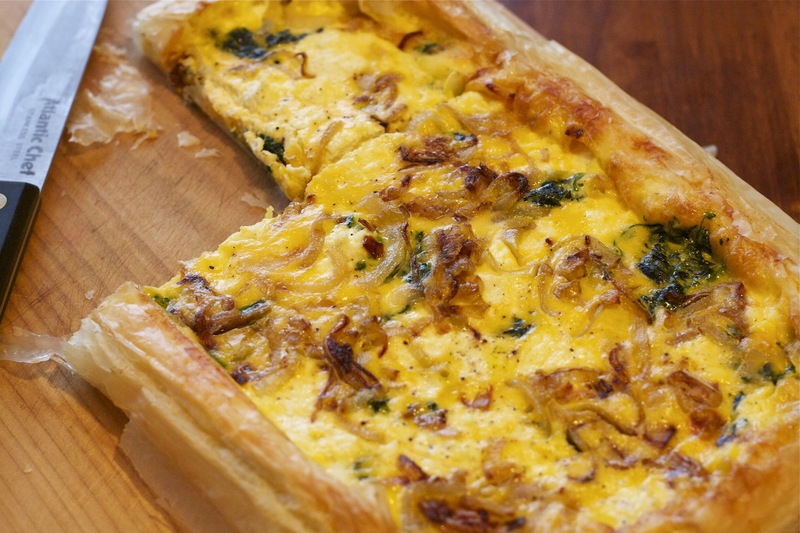 I had to think of a great way to use the Ricotta that I had made, I love experimenting, but really, you can’t go passed the classic combination of eggs, onion, pastry and cheese, it’s a winner every time. Defrost two potions of frozen spinach and drain out the water. A good portion of caramelised onions. Beat eggs, cream and milk in a bowl, set aside. Grease a sponge or tart tin. Start layering sheets of filo, pasting with melted butter in between, until you get to around 8 layers. Line the tin with the filo. Spread the filo over the bottom of the tart. Sprinkle ricotta around the tart dish. Pour in the egg mixture, and season with salt and pepper. Top with a good portion of caramelised onions. Brush any filo hanging over the edges of the tin with butter and carefully fold over the edges of the tart towards the centre, or arrange any way you like – I was going for a rustic look. Bake on 175ºC for around 25 minutes, or until the middle looks set and the onions are JUST starting to brown more. Enjoy with salad and some pickle on the side.